Every year we take all of the 2nd graders in our district to see a performance of the Carnival of the Animals. A few years ago the Visual & Performing Arts department worked with a theatre artist to create a new storyline to go along with the symphony performance. It is much more engaging now, even getting the 2nd graders involved singing along with specially written lyrics to the Lion and the Elephant movements. It is great to be able to offer the experience of a live professional orchestra & professional theatre performance to all of our students. 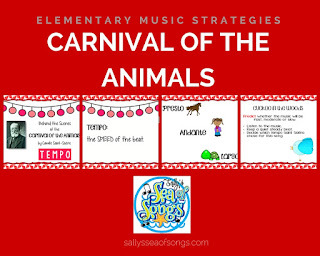 There are 14 movements in the Carnival of the Animals, counting the introduction and the finale. Considering that we also have to teach appropriate audience behavior and talk about field trip forms, covering everything can take a lot of teaching time. 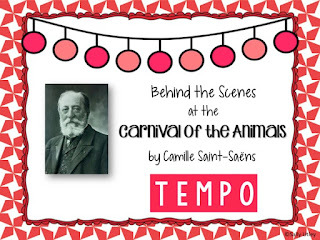 I want to look at Saint-Saëns music carefully to see what music concepts can be taught or supported through listening and moving. 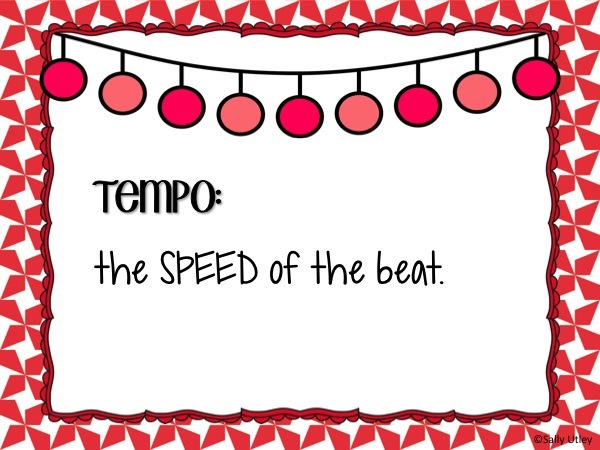 Tempo is a great concept to include at the beginning of the 2nd grade year. We have been reviewing steady macrobeats in duple, triple, and unusual meters, and chanting rhythm patterns in duple and triple meters. It is a simple step to change the tempos to create interest and keep students engaged. We began the tempo lesson by singing a familiar song, both with an accompaniment track and with our unaccompanied voices. Then I pulled out a metronome to tap a steady beat, and we sang to match that beat. If you don't have a physical metronome, use an online metronome such as this one: https://www.metronomeonline.com/. 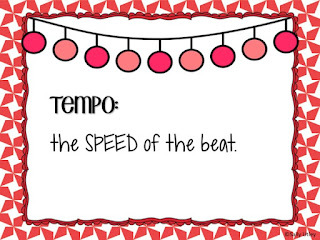 After several students took turns changing the tempo on the metronome we had a short discussion on which speed was best for that song, followed by the definition of tempo as the speed of the beat. Because this is 2nd grade and the beginning of the year, we focused on only 3 speeds: fast, moderate and slow. 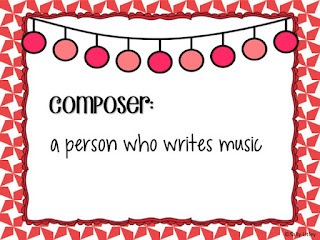 Next, we reviewed the definition of a composer as a music writer. 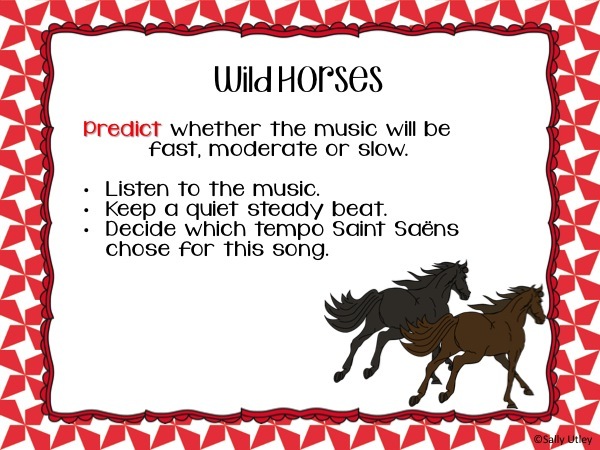 After we remembered the facts about Saint Saens’s life, we made a prediction about what Tempo he would have chosen for a song about Wild Horses (or Wild Donkeys as many call it). 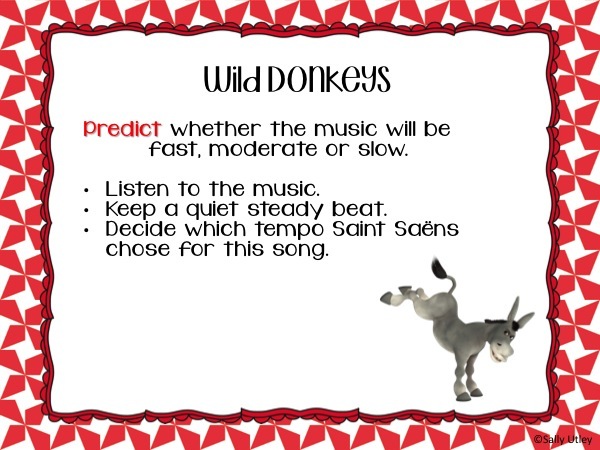 I made a checklist screen to guide this section, and then another YouTube video with a Claymation video of the Wild (Donkeys). (if anyone finds a better video, please share!) We listened to this again, moving our hands fast in KumBaYah type circles, up and down as the pitches move up and down. 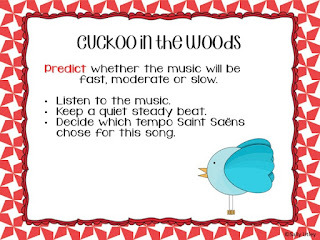 I followed the same pattern for a slow movement, Cuckoo in the Woods. Checklist, watch video, listen again with hand movements. I plan to listen to this one again next week and have the students move around the classroom matching their feet to the music, pausing to listen to the cuckoo. 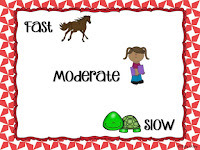 Also next week, I will review the Tempo definition and introduce the Tortoise movement by first introducing the Can Can. I found this YouTube video for the Beethoven’s Wig version of the Can Can (with silly lyrics). Saint Saens was from France, and certainly knew the Can Can, so that tie-in reminds students of where he lived. We listen, determine the tempo, and of course we get up and do the dance! When they are good and tired, we sit and think about how a tortoise moves, could a tortoise dance, and what would it look like if a tortoise was doing the Can Can. We have already been up kicking our legs, so I ask them to Can Can with their hands as if it were the front legs of the tortoise, listening all the time for the Can Can melody at a slow tempo in the double bass. 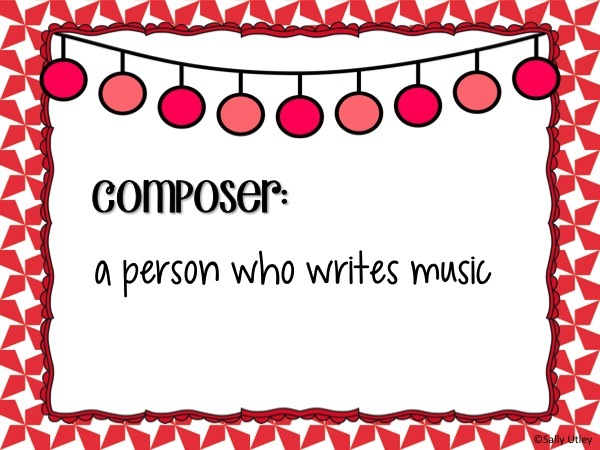 This year, we are fortunate to have access to the Quaver curriculum, and I have found a couple of Quaver resources to get me started. First Grade Lesson 22 is on basic tempos. (You can change the Welcome screen to say 2nd Grade in just 3 clicks from the Tools menu, bottom right of screen.) I decided to start out with this lesson, doing the first 3 activities just as they are, then we will use a couple of Quaver's tempo IWB activities. I added several screens and videos as listed above right in to the Quaver lesson. Nice! Adding the videos as screens in Quaver means that you avoid all of the ads and the extra previews around the screen. Your students will only see what you want them to see. Use the www.safeshare.tv option to create safe links if you do not have access to Quaver. I have included these links for the videos listed in this post for your convenience. 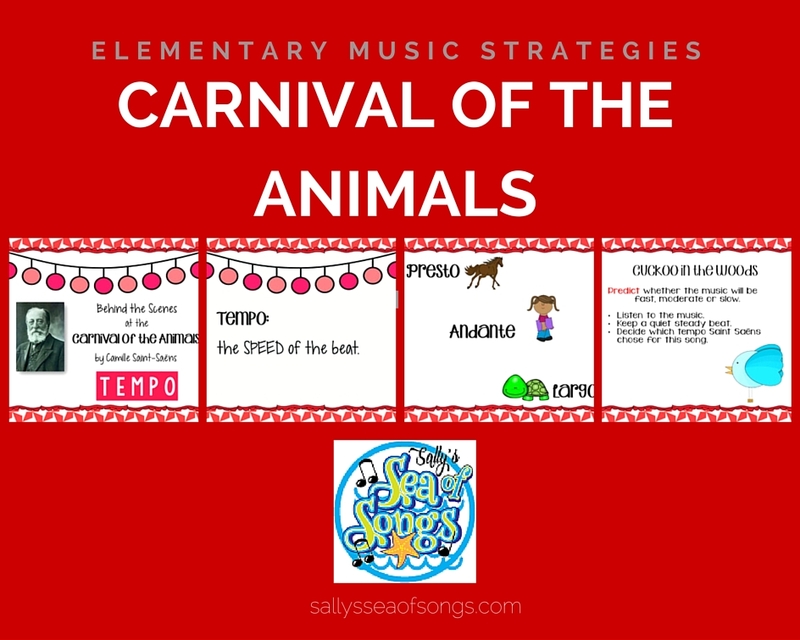 I hope this gives you an idea of how to use the Carnival music to support music concepts. Please share your ideas! What's on Your Wall - Check Out the Music Room!